Maia Pearl is a Frenchtown native. A nature girl through and through, growing up along the banks of the Delaware has always inspired her senses as well as her soul. She experienced her first taste of yoga at the age of 12, tagging along with her mother to AmarJyothi’s classes. When she moved to upstate New York in her late teens, she found herself seeking out yoga classes in the small spaces between a busy schedule. 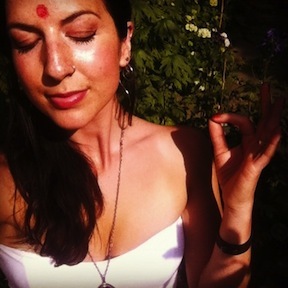 She began frequenting Yoga Loka after moving back to her hometown in 2011. She completed the 200 hour teacher training program with AmarJyothi in 2013 and is currently working towards her 500 hour certification. Her desire to practice yoga started with the urge to move her body and surmounted in what she would now refer to as a life long journey towards worship of the inner self. Feeling steady and comfortable in body and mind is her curiosity and her passion. She hopes to inspire others to take a deeper look, both on and off the mat. Yoga, nature, loving company and good food are what Maia feels most passionate about. In addition to her training and teaching, she works at the Lovin' Oven: a local farm to table restaurant just up the road from Yoga Loka. She currently resides in the woods of Upper Black Eddy with her boyfriend Jack and their black cat, Willy.